von Neumann, Weyl and Einstein( see, CondMat Physics and Einstein) were among the earliest members of IAS having office at Princeton campus during their first few years. 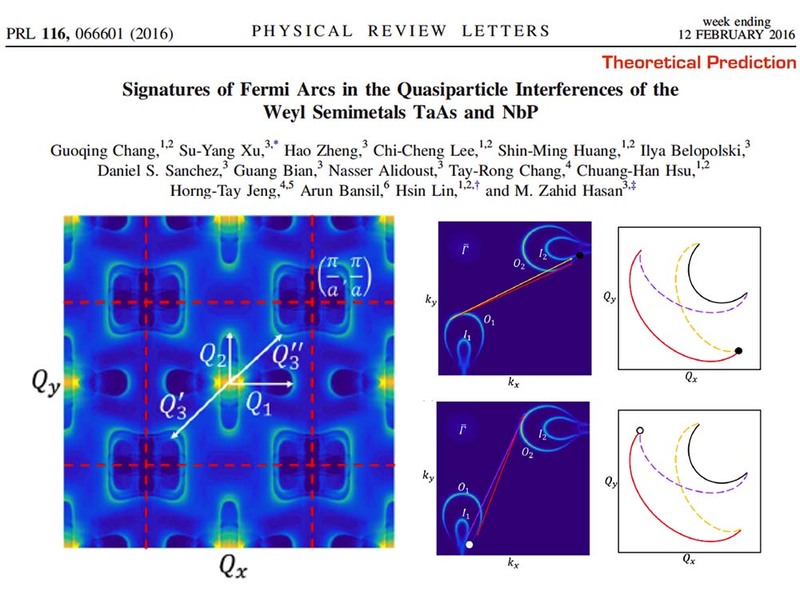 Wigner and Weyl were responsible for introducing group theory into physics, particularly the theory of symmetry in physics which proved to be essential for understanding quantum properties of solids. 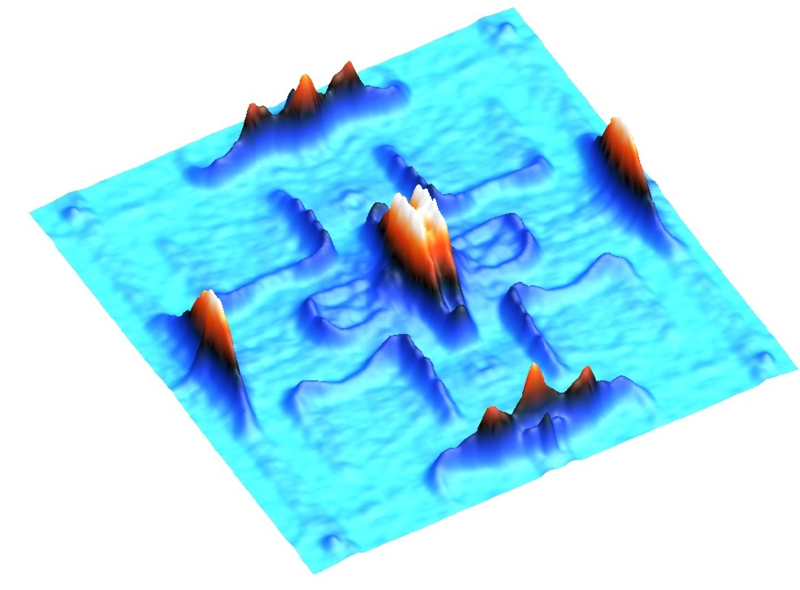 Many of Wigner's works, laid the early foundation of solid-state physics which include, concepts of Wigner-Seitz cell, Wigner crystal, Wigner lattice, Wigner energy, Wigner effect, Wigner distribution function and extended versions of Wigner's theorem. at Princeton's physics department laid the early theoretical foundation of the field (accidental band degeneracy, diabolical point etc.).. 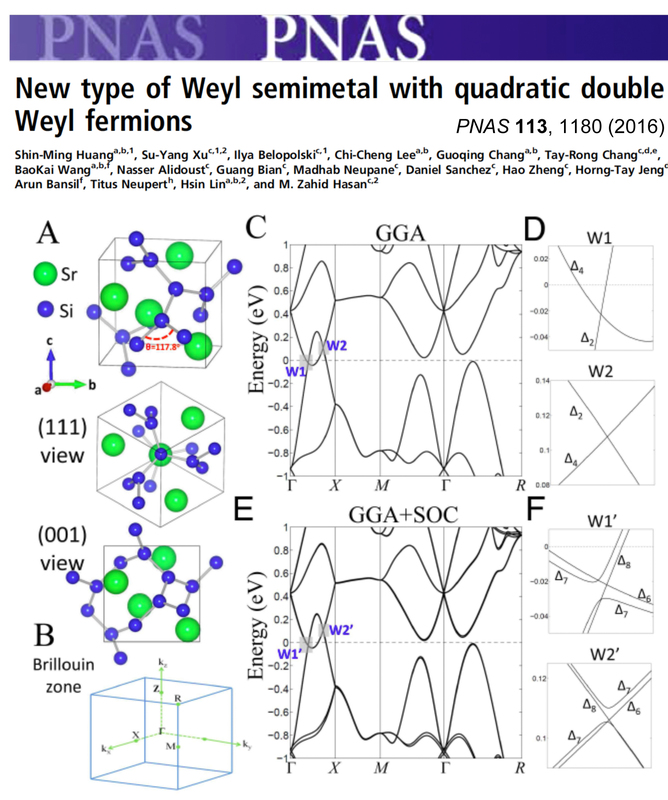 Weyl Semimetal discovery methods US Patent App. 15/352,279 , Granted. 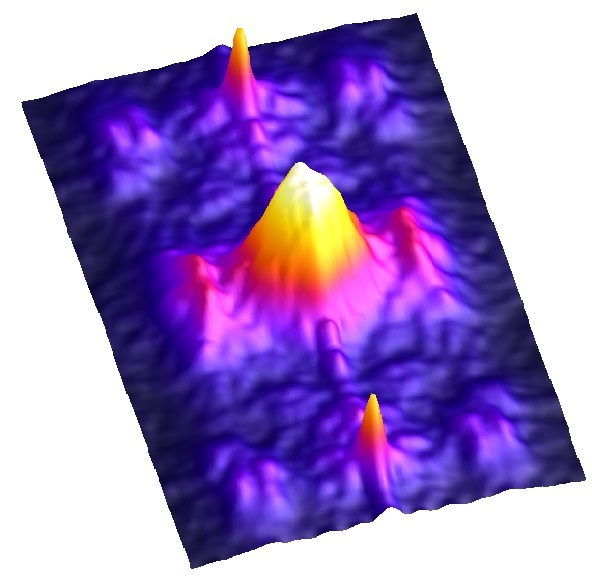 see, KITP program on topological materials..
Topo. 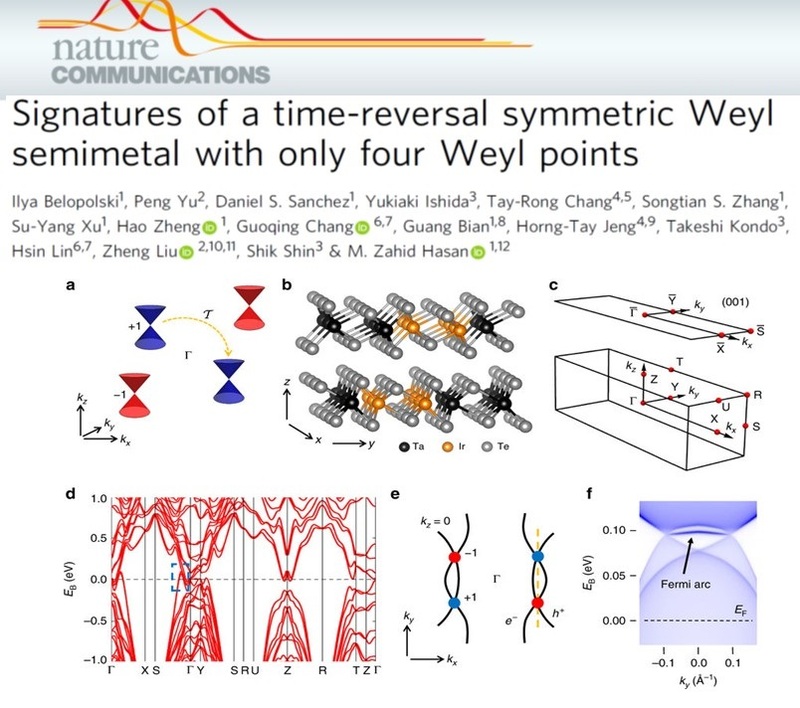 Insulators to Weyl semimetals : a short review by Burkov on "Topological Semimetals"
Moore foundation Symposium talk : "Theoretical and experimental discovery of Weyl fermion, topological nodal-line fermion and Chiral anomaly materials and the new physics frontier"
"(Theoretical prediction) New type of Weyl semimetal with quadratic double Weyl fermions"
"Discovery (Theoretical and Experimental) of Weyl fermion semimetal and topological Fermi arc quasiparticles in TaAs, NbAs, NbP, TaP and related materials"
"Theoretical & experimental discovery of Weyl, topo. 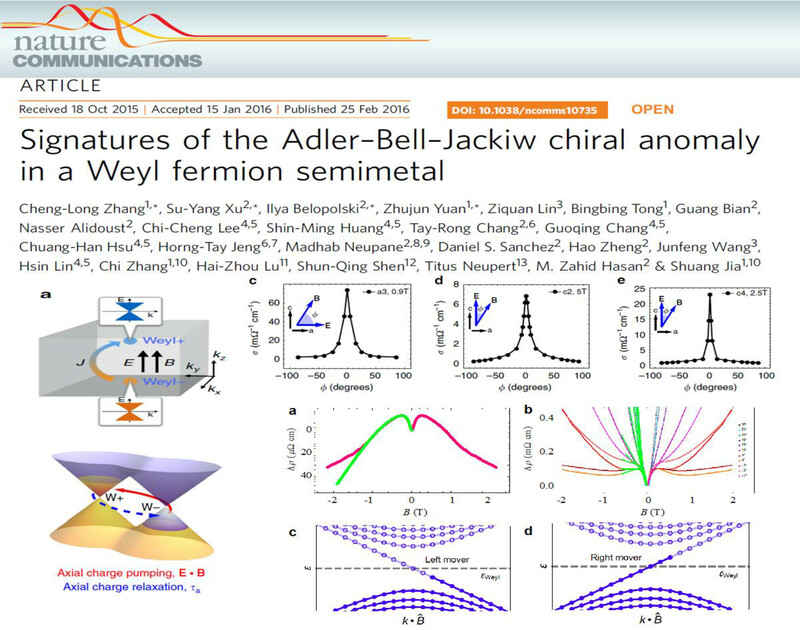 nodal line & chiral anomaly materials"
Princeton theory center (PCTS) talk : "Theoretical and experimental discovery of Weyl fermion, topological nodal-line fermion and Chiral anomaly materials and the new physics frontier"
Physics Colloquium: "Discovery of Weyl fermions and topological Fermi arcs"
PhysicsWorld News: "Weyl fermions are spotted at long last"
Discovery of a Weyl Fermion semimetal and topological Fermi arcs. Published in S.-Y. 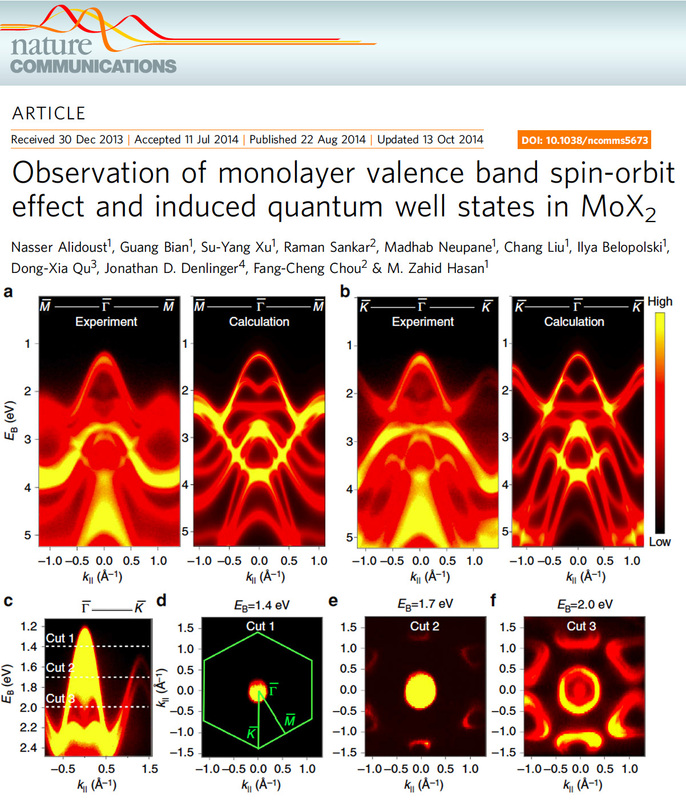 Xu, I. Belopolski, N. Alidoust, et al., Science 349, 613 (2015). 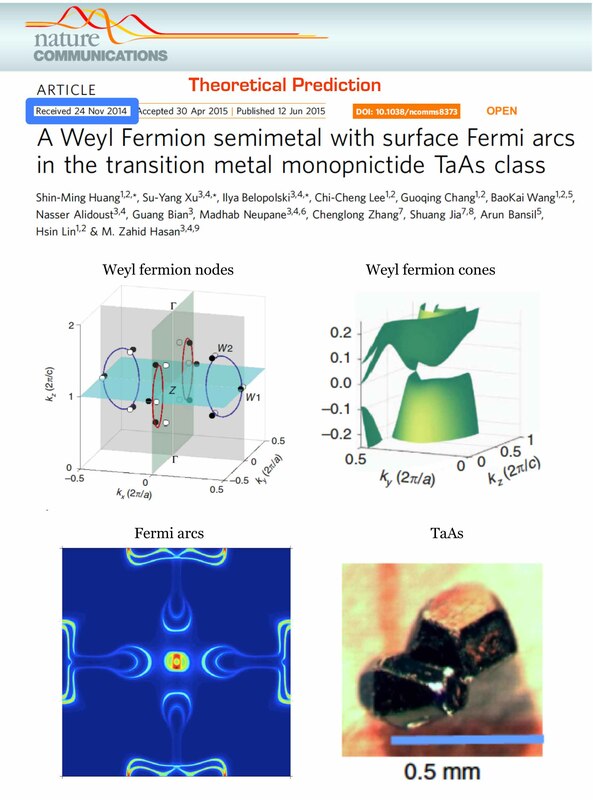 A Weyl Fermion semimetal with surface Fermi arcs in the transition metal monopnictide TaAs class. 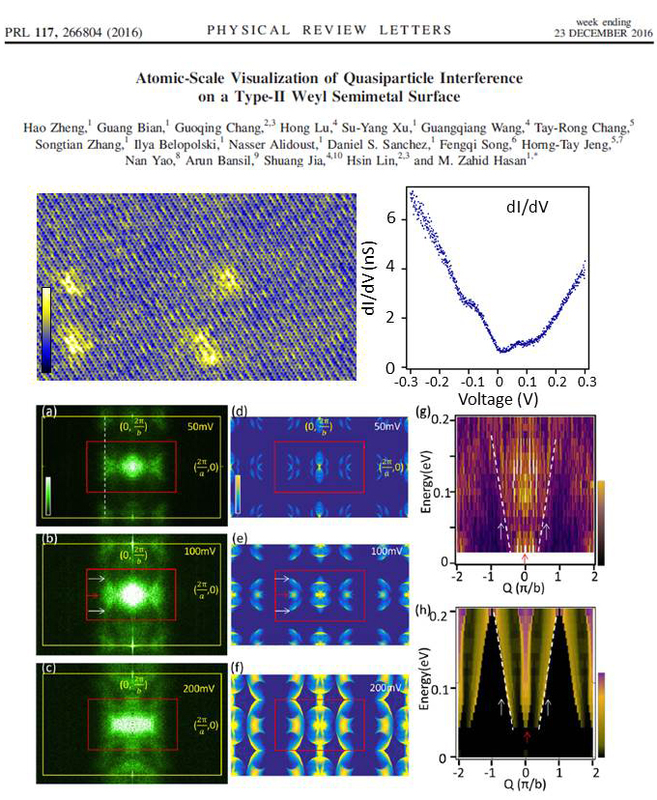 Published in S.-M. Huang, S.-Y. 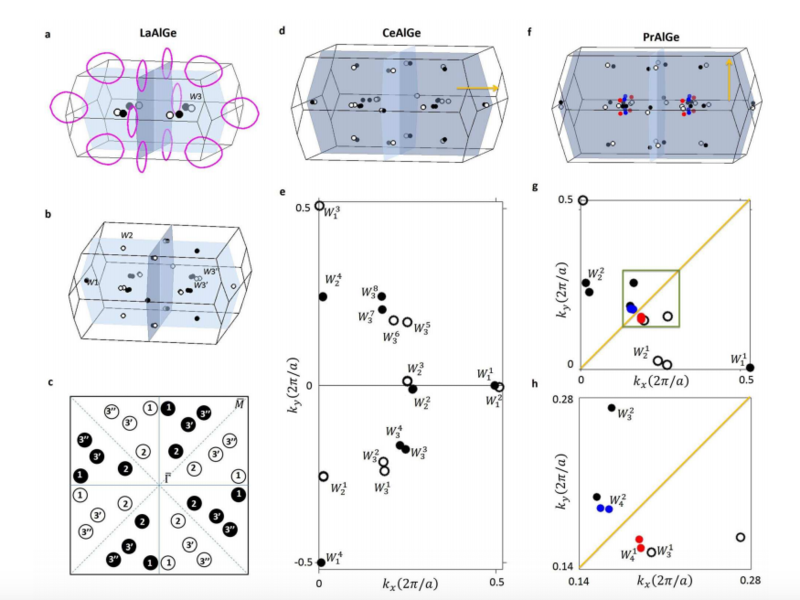 Xu, I. Belopolski, et al., Nature Commun. 6:7373 (2015). 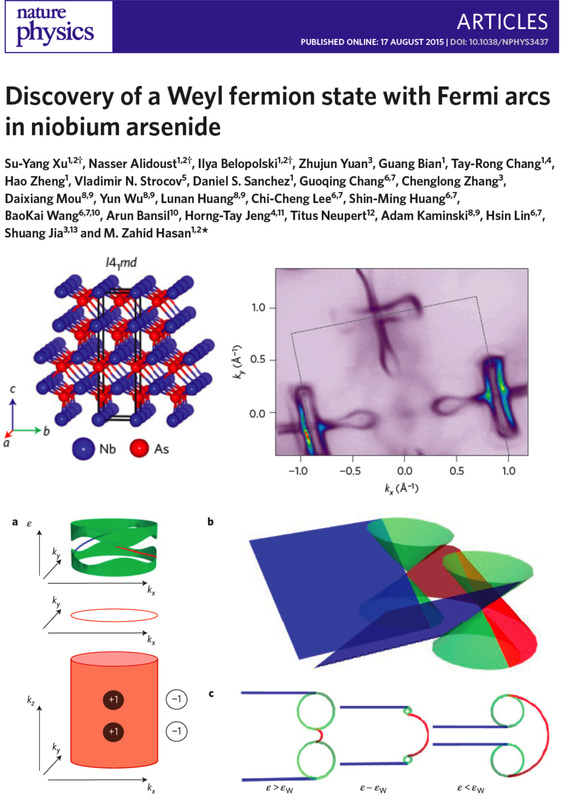 Discovery of a Weyl fermion state with Fermi arcs in niobium arsenide. Published in S.-Y. 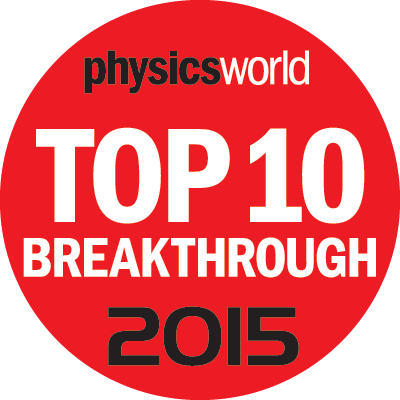 Xu, N. Alidoust, I. Belopolski, et al., Nature Physics 11, 748 (2015). 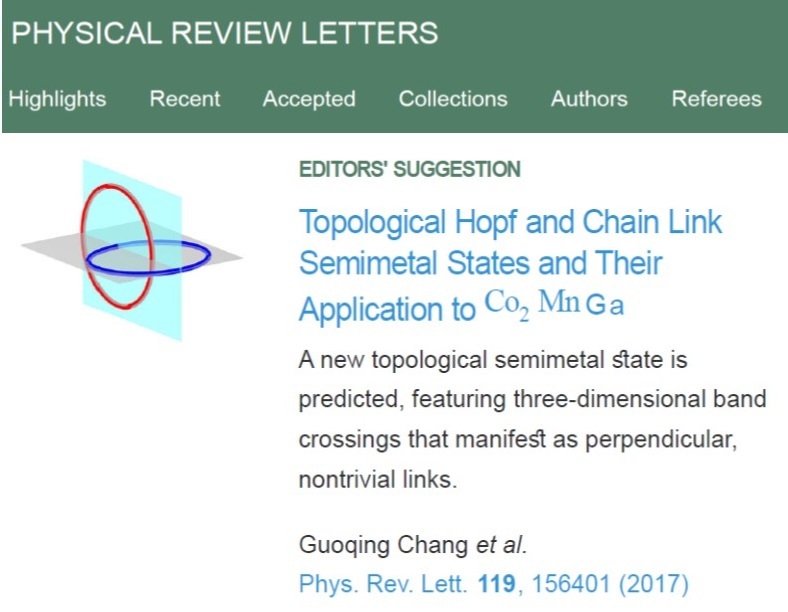 Experimental discovery of a topological Weyl semimetal state in TaP. Published in S.-Y. 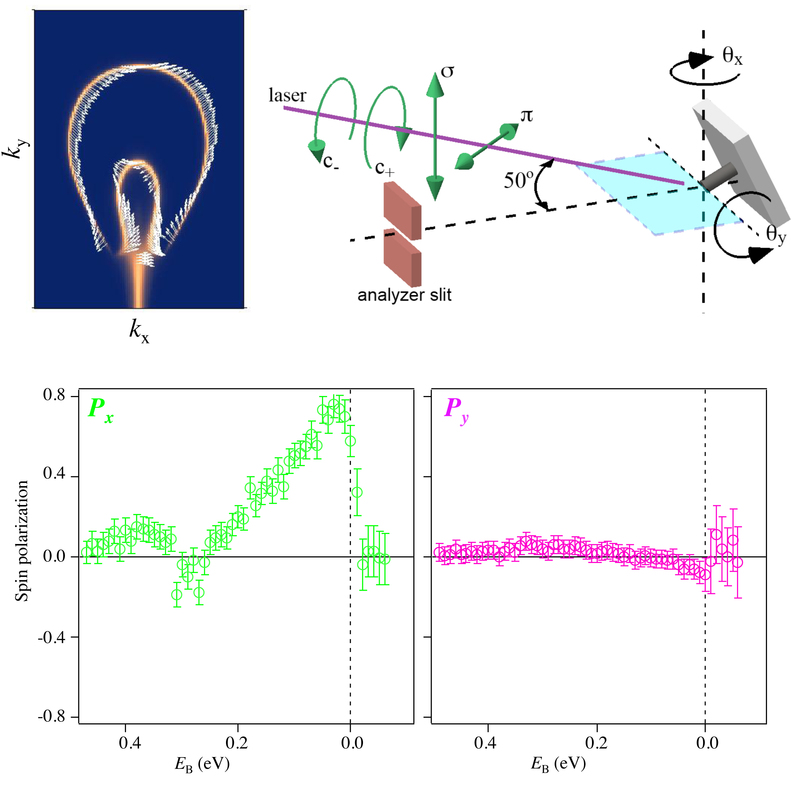 Xu, I. Belopolski, D. S. Sanchezet al., Science Advances 1, 1501092 (2015). 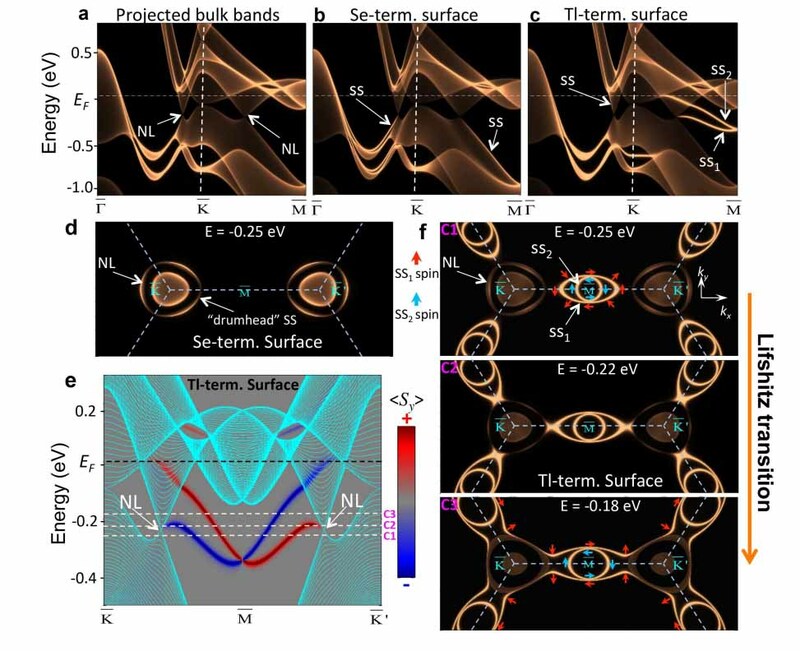 Topological electronic structure and Weyl semimetal in the TlBiSe2 class of semiconductors. 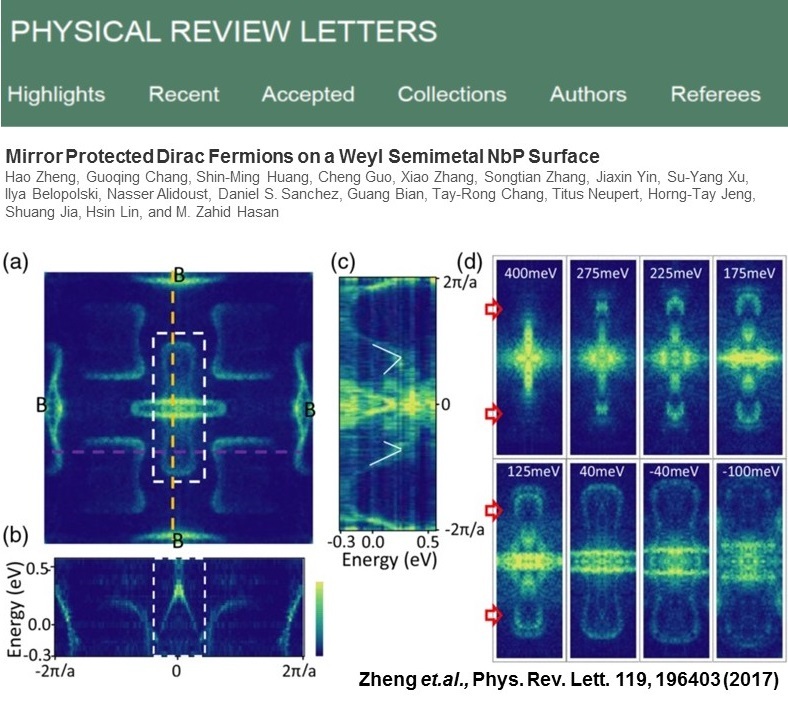 APS-Physics (American Physical Society): "Weyl Fermions"
Science News: "Elusive particle shows up in semimetal"
Nature Materials News: "Weyl fermions: Massless yet real"
Nature Physics News: "After a Weyl"
ChemistryWorld News: "Elusive fermion found at long last"
Physics (American Physical Society): "Where the Weyl Things Are"
NaturePhysics: "Discovery of a Weyl Fermion state"
Drumhead Surface States and Topological Nodal-Line Fermions in TlTaSe2. G. Bian.,T.-R. 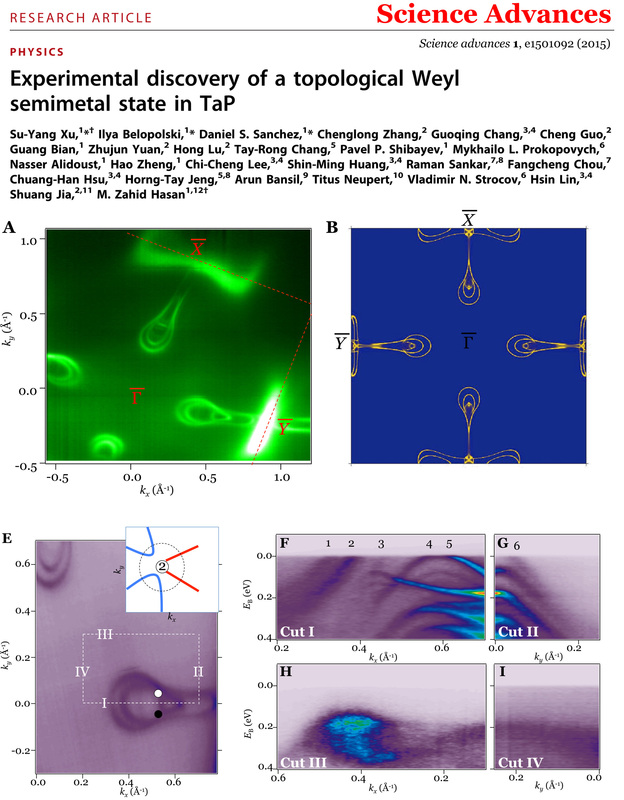 Chang., H. Zheng, et al., Phys. Rev. B 93, 121113(R) (2016). 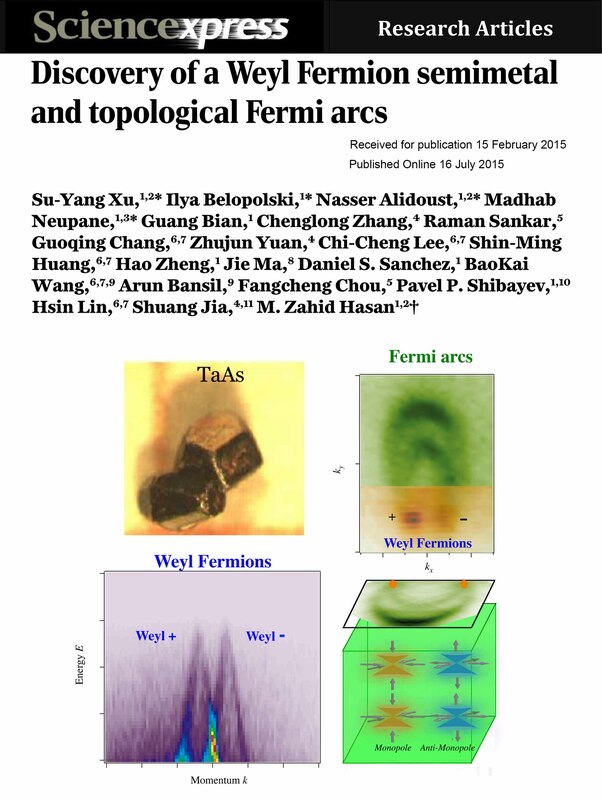 A strongly robust Weyl fermion semimetal state in TaS. G. Chang, S.-Y. 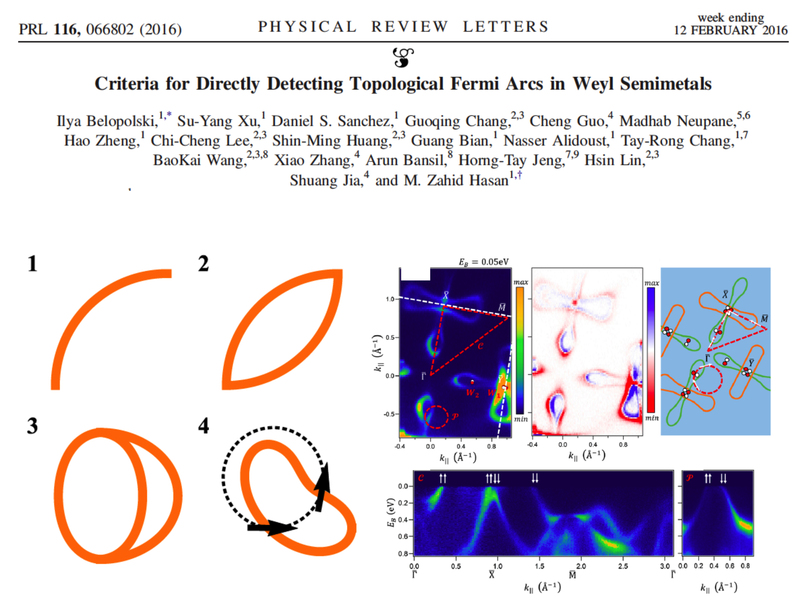 Xu, D. S. Sanchez, et al., arXiv:1512.08781 (2015). 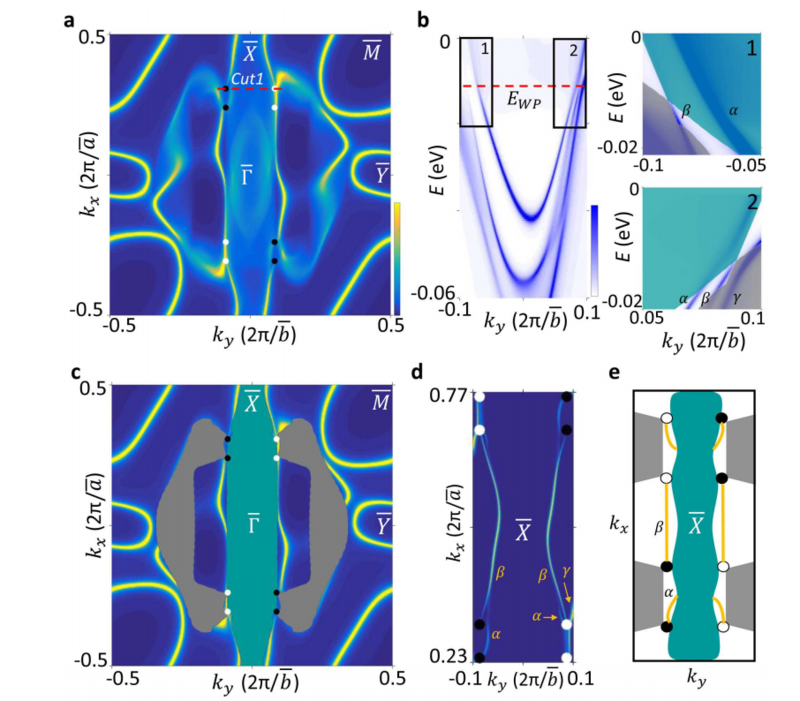 Arc-tunable Weyl Fermion metallic state in MoxW1-xTe2. 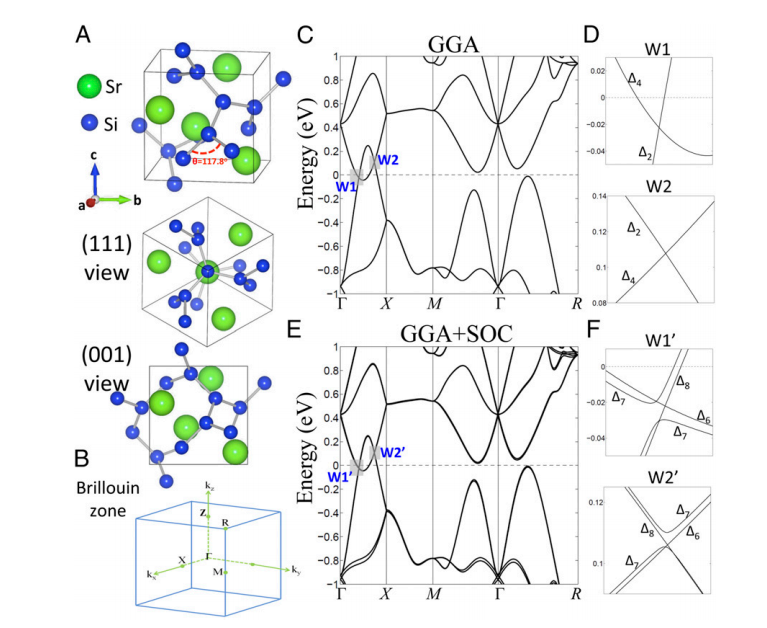 Magnetic and noncentrosymmetric Weyl fermion semimetals in the RAlX family of compounds (R=rare earth, Al=aluminium, X=Si, Ge). 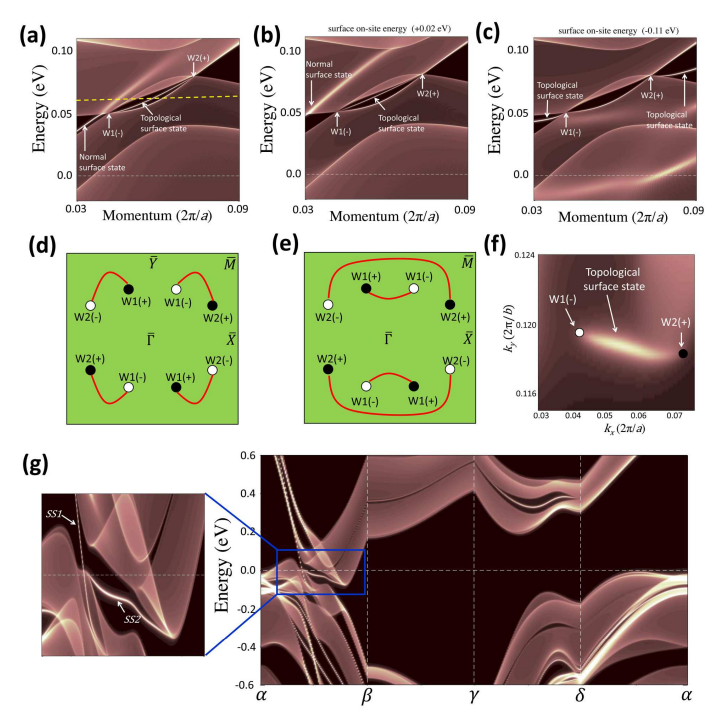 Room-temperature magnetic topological semimetal state in half-metallic Heusler Co2TiX (X=Si, Ge, or Sn). 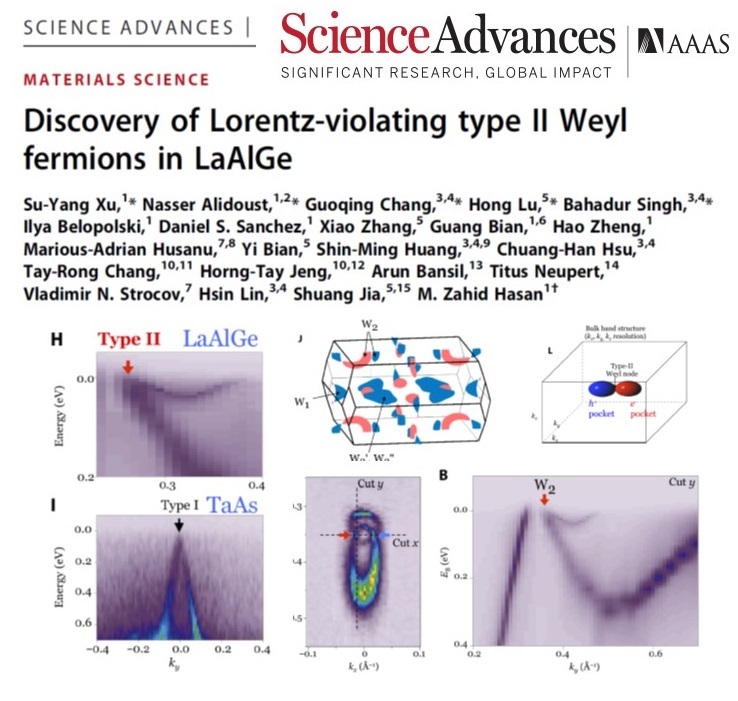 (Theoretical prediction and experimental observation of) "Mirror Protected Dirac Fermions on a Weyl Semimetal NbP Surface"
"Discovery of Lorentz violating type-II Weyl fermions in LaGeAl "
H. Weyl had a Princeton address in his fermion paper (Z. Phys. 56, 330 (1929))! 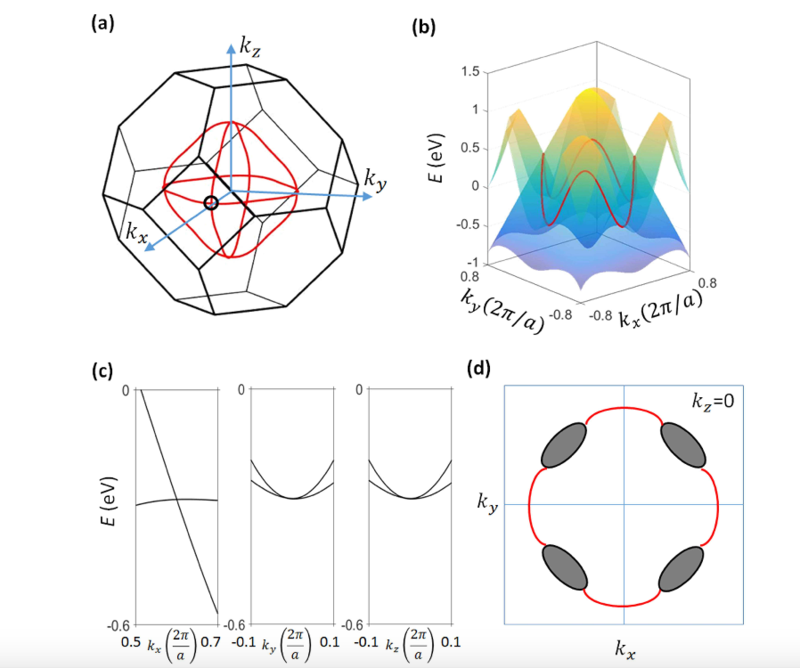 Tilted Weyl cone in topological materials bears an analogy to the lightcone bending near blackholes (simulated Lorentz violation in quantum matter). 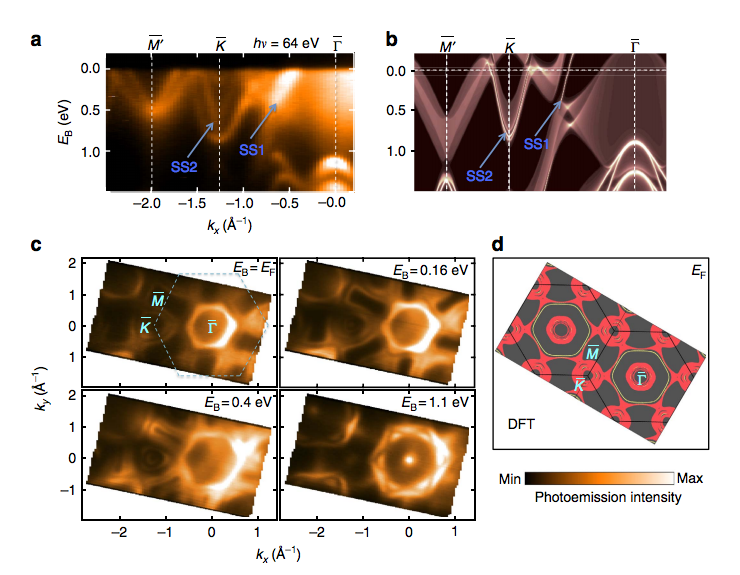 connected with giant arc-like surface states, are predicted. in a wide variety of chiral materials."